A hidden-object game. Each beautifully illustrated panel shows a scene from a classic Grimm's Fairy Tale, including Little Snow-White, Little Red Cap, Sleeping Beauty, Hansel and Gretel, Puss in Boots, and Cinderella. 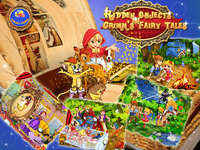 In each scene, find all of the hidden objects to progress!